Arsenal seal Chris Willock deal Arsenal have officially announced that youngster Chris Willock has sealed his first professional contract at the Emirates. Arsenal have officially announced that youngster Chris Willock has sealed his first professional contract at the Emirates. Willock has finally sealed his first professional deal with the North London side after impressing in the under 18 level. He has been a regular player for under 18 side, has played six of their last seven UEFA league games. Willock featured for Arsenal's senior team last summer in a friendly game against Boreham Wood. The 17-year-old will now pay for under 21 side of the Gunners and could even get a debut this season if he shines quickly. "Everyone at Arsenal would like to congratulate Chris on his first contract, and we look forward to his continued development at the club." Arsenal sealed another deal after the transfer window, midfielder Francis Coquelin and striker Chuba Apkom have also recently signed a new deal at the Gunners and now Willock has added his name among them. While reports also revealed that former West Ham player Ben Sheaf has also sealed his first professional deal at Arsenal. 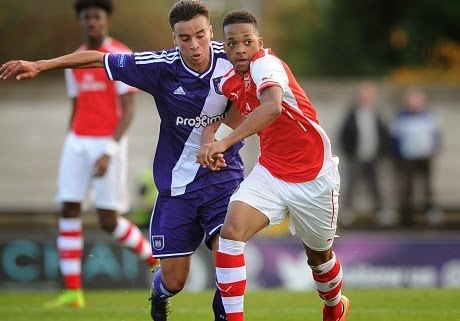 The 16-year-old is the fourth player who signed a deal at the Gunners this month.